Images in this unit may cause sadness or distress to Aboriginal and Torres Strait Islander people. The reading and writing activities throughout this resource provide many assessment opportunities. Often these tasks integrate the receptive and productive modes as the exploration and appreciation of the focus text is the springboard for student creation of new imaginative texts. In this way, the critical and creative processes are equally valued. Whilst they are detailed throughout the resource they are synthesised in the final section, Informed Reaction, where the portfolio will be used to bring them all together for refinement, publication and assessment as teachers require. In this learning activity students explore the idea that they can find stories in their immediate worlds through exploring the nuances associated with the snapshots and photographs that document lives in family collections. Students create written sketches of people and their lives. Show students an example of a snapshot (PDF, 431KB) and explain that the etymology of the word “snapshot” has its history in the sport of shooting. A “snapshot” was a hurried shot, a shot with no deliberate aim. Prior to the rise of social media, it generally represented personally important subject matter for use and interpretation in private or informal contexts. More formal photographs, portraits for example (PDF, 431KB), are deliberately constructed often with a group of selected people looking directly at the camera. Divide the class into two groups and distribute one image to one group of students and the other image to the second group. Reflecting on the emotions and feelings suggested in the image. Analysing the stance and gestures of the images’ subjects; the 1960s’ Australian context in which it occurs; who might have taken the picture and why; what might have been happening or is about to happen? Instructing students to individually write a caption for the allocated image and then ask students to share these captions with others who have been allocated the same image. Students discuss and offer explanations for the emotions, stance and gesture of the subjects including who is and who is not in the image. Now form the class into new pairs, making sure that one student has the snapshot and one has the photograph. Students should then compare their captions. Inform students that these images are of members of the same family. Bearing in mind Astley’s remark that “moments and incidents” can act as “emotional stimulus” for stories, discuss as a class the possible stories that could grow from the portrayal of this family. Using both images, what sketch of these subjects could they create? Next, have students locate a photograph of themselves or a family member and describe, reflect on and analyse the image in the same way as the previous activity and then sketch in words a person, place or situation related to the image. Another possible writing opportunity that could be developed from this activity would be to have students develop a piece of writing about a family without a photographic record, i.e. the family without a shoebox full of photos, photo albums, an online identity or hard-drive full of photos. NB: This activity is an opportunity to assess student production of text and has potential for inclusion in the final portfolio or as a mandated rich assessment task in the portfolio. In It’s Raining in Mango Astley highlights how Aboriginal people are displaced in, and dispossessed from, their own land. In this learning activity students explore how texts represent the Indigenous experience. In their reading and viewing of texts produced by Aboriginal artists Gordon Bennett, Brook Andrew and Vernon Ah Kee, students appreciate that a large part of any text is written not by its author but by the world its author lives in. Mango, published in 1987, was written in anticipation of Australia’s bicentennial celebrations in 1988. In this group work activity students explore a range of texts, develop a question for inquiry related to the representation of Aboriginal perspectives, investigate the question and deliver their findings in a presentation. Display for students the image of Gordon Bennett’s 1988 artwork, Australian Icon, withholding the title from the students. Discuss with students what they see as the meaning of the work – the storm-tossed ship from a distance, on close inspection the red dots that suggest landscape. How does the date of this artwork’s creation shape your understanding of it? In what ways is this artwork satirical? Inform students that colonialism is a powerful historical force that shapes the political, social and cultural identities of the colonised and colonising people and that colonialism “others” the people colonised. How does this statement position Aboriginal people as lesser or different? How does this statement grow from the context in which it was written? In what ways does it grow out of colonial rule? Do you think this statement is out-of-touch with current views? How might you rewrite this statement so that it shifts the focus from the coloniser to the colonised? In what ways do the image and the statement both exemplify that a large part of any text is written not by its author but by the world its author lives in? How does Bennett reframe a story from the past for an audience in the present? Inform students that postcolonial perspectives explore the conflicts between the colonisers and the colonised, who resist and strive to assert their identity. One way this reveals itself is in the “European gaze” that often frames texts. Use this extract from Palmerston’s Diary of a Track-cutting Expedition from the Johnstone River to Herberton as the basis for an exploration of the European gaze. Christie Palmerston was an explorer and bushman from North Queensland. Still raining. Started again through this dreary stretch of blackness in a north-westerly direction over a basalt tableland covered with dense jungle. In about three miles ran foul of another precipice, could hear the roar of impetuous waters hundreds of feet below me. Rain, rain, everywhere I try to look there is a black patch between me and the object I wish to look at. Turned southward again and had level travelling all the afternoon, gradually worked my way north-west again and in two miles struck a large river, the Beatrice, the bed of it being full of huge boulders, current broad and very strong. Camped here, raining fast and so piercingly cold that my companions’ limbs are thoroughly numb. Mr. Kevin O’Doherty gave me two bottles of rum which I broached here. I never thought rum was such a delicious drink, seemed to instil new spirit into my boys. Blacks very numerous following us most of the day, one requires more than the usual share of patience to kindle the fire with wood as soft as a boiled turnip. I carry candles for the purpose; and in fact if it had not been for the candles we should never have got a fire but seldom. I have to handcuff the two Johnstone boys every night and all the scrub knives and tomahawks are stacked for me to sleep on, this precaution being needed because not one shred of reliance can be placed on my boys. I am acquainted with these aborigines’ treacherous ways only too well and am inclined to look upon with suspicion their every action, trusting them just as far as I am obliged and no further, for at any moment they may attempt to steal a march on me and one feels unutterably lonely with such companions for they are actually worse than non entities. Hand out the extract (PDF, 120KB) as a series of sentences that need to be rearranged. Working in pairs, have students reconstruct the passage and compare their construction to the original text. How similar was your reconstruction of the extract to the original text? Were there any sentences that you found to be disconcerting? Why? Compare Palmerston’s portrayals of his relationship with the landscape to his portrayals of the Johnstone boys’ relationships with the landscape. Who do you think is the “outsider” in this extract? Why? Does this extract reflect a European gaze and, if so, in what ways? Invite students to read the entries for Christie Palmerston in the Australian Dictionary of Biography and on the Monuments Australia website and ask them to work, in pairs, to discuss what new questions they have about Christie Palmerston. Form the class into groups of four to share and compare their questions and synthesise their questions into one clear and compelling question. As a class have students present their questions to the class for discussion and debate, exploring whether they think the complexities associated with colonisation prevail today. Working in the same groups, and using the compelling question they have developed, invite students to apply this question to these visual texts. Students will present their findings in a presentation to the class. whether the representation of the colonised and the coloniser was complex or stereotypical in some way. whether they feel the original Palmerston extract was deliberately or unconsciously demeaning. whether the other contextual material they have explored has altered their original response to the Palmerston extract. whether the artists have reframed a story from the past differently for a contemporary audience or whether how the artist has framed the story is discordant for contemporary audiences. Write a series of statements that relate the selected texts to the compelling question they have created. Write the text (speech, writing) to be included. Decide on any effects to be included: transitions, music and so on. Possible styles of presentation could include a Pechakucha (20 slides: one each 20 seconds) or a TED-style talk. Australia’s tropical north has long held a fascination for writers, film-makers and artists. Patrick Buckridge and Belinda McKay suggest in the chapter, “Warm Words” in By the Book: A Literary History of Queensland, that the portrayal of North Queensland has ranged from the exotic location to the pioneer narrative, sometimes unquestioning the patriarchal assumptions at play, other times contesting these. Queensland is sometimes seen as a place where different rules are at work, rules different to the southerners (which Astley noted wryly meant Brisbane and anywhere further south). Pioneers in the frontier tropical north are often represented struggling to cope with the physicality of the landscape, its impact on identity and a sense of belonging. Queensland as a playground or paradise (think “schoolies’ week”) is a familiar trope. How individuals see landscapes is influenced by their experiences of, and feelings, intents and judgements about, that landscape. In this way we could say that a landscape is created by a mindscape, and mindscape is created by landscape. The activities that follow could be completed sequentially by the whole class or as group activities. The learning strategies presented here are intended to support students to read complex texts using a reading workshop model. Prior to the lesson have students bring in an image, sound, text, word, phrase, film sequence that evokes a personal landscape that has particular meaning for them. Conduct a minilesson where you introduce Thea Astley’s lecture, Being a Queenslander (PDF, 1MB), using a think-aloud strategy (PDF, 132KB). The minilesson sets the purpose of reading and demonstrates how students can approach the complex text. After modelling this strategy for students, have students work in pairs to read the lecture, or a section of the lecture, exploring how Astley thinks individuals are shaped by landscapes. Have students record their findings. Begin by skimming the webpage paying particular attention to the opening and closing of the section you are reading closely. Avoid, at this early stage, writing down facts and examples. Read closely to determine the purpose of the text (its thesis). Think about context. What audience is the text written for? Who is the text in dialogue with? Note down the kinds of reasoning employed – the nature of the arguments, the concepts used, the organisation of information, whether the author has used historical, literary or sociological reasoning. Consider the claims that are made and the evidence offered. How is this used to control the thesis? Is the evidence historical, literary, sociological? Evaluate what you have read: what has been omitted? What are the core assumptions on which the viewpoint has been founded? Are there gaps in the thinking? Can you offer an alternative viewpoint? Distribute to students the following statement and question and ask them to discuss in pairs their responses, recording their views for further sharing in groups and as a whole class. How individuals see landscapes is influenced by their experiences of, and feelings, intents and judgements about, that landscape. In this way we could say that a landscape is created by a mindscape and mindscape is created by landscape. Is this evident in the website portrayals you have studied? Give reasons for your response. As a whole class, discuss the relationship between individuals and landscapes as shown in these texts. How does “schoolies’ week” relate to the playground and leisure perception? How is conflict embedded in the mindscape of a frontier society? Refer students to the texts they brought to class at the beginning of this activity and have them describe the mindscape that arises from the text they have selected in an extended paragraph. This paragraph could be the opening to a lecture similar to the one given by Astley. Students could include literary extracts to encapsulate their experience or viewpoint, much as Astley has done in her lecture. NB: This activity, focusing on the receptive modes, is suitable for inclusion in the student portfolio. Edgar Allan Poe points out in his essay, Marginalia, that he always enjoyed “an ample margin” because he could pencil “suggested thoughts, agreements, and differences of opinion, or brief critical comments in general.” He notes that margins contain “bold comments” rather than “literary chit-chat” or “talk for talk’s sake, hurried out of the mouth.” Student reading reflections need to focus on the reader’s interaction with the text, as it occurs, in effect providing a student with the “story of their reading”. The double entry method of journal keeping outlined below might prove useful here. The journal should form part of the portfolio students compile throughout the unit. having students synthesise the responses suggested in their annotations in extended paragraphs. Students listening to each other’s responses and discussing the diversity of responses and viewpoints. Explaining to students that both readers and texts have characteristics that influence responses. Inviting students to list the factors (values, beliefs and attitudes) that influence their response as a reader and how these influenced meaning and the factors (realism, historical context and narrative technique) that influenced the text and how these influenced meaning. the framing of the prologue and the introduction of Connie. the portrayal of colonialism and its impacts on the Indigenous. prevent students offering one word answers. Provide students with this extract (PDF, 148KB) from the prologue and ask students to read it silently and note down specific images that resonate, amuse or surprise them. What did you see as you read the extract? Which elements of this extract did you find challenging on first reading? Model a reading process for students by reading the text aloud and sharing the surprises, questions, confusions, observations about images encountered in the text. This models for students a language for thinking about reading. suggest Reever and Connie’s relationship to the landscape (matted green, sun-cured, mud-rut, the ticking of summer grass, against tree hiss, against the whooped amusement of hidden waters, lewdly mouldering heat paws at her). Have students share their responses as a class, review their initial responses and resolve those elements that may have needed further consideration. the description of the cyclone in Mango (p. 199). Discuss with students the impact of the images chosen in the text. Ask students to write an extended paragraph exploring how Astley has portrayed “simple working people”. Is it pyrotechnical? The word “metaphor” meant “transference” in Ancient Greek. Metaphors create a pattern in the mind of the reader and lead the reader on a journey of imaginative response. Astley’s writing is characterised by recurring patterns: one of these is the representation of characters and places through ideas associated with discovery, frontiers and maps. In this activity students explore the metaphor of “the map” and how it influences response. consider which characters in the text generally could be described as “right off the map”. What does the background of “the susso” tell you about his character? In what ways does “the susso” disrupt Clytie? Why does “the susso” draw Connie and Will the way that he does? What comparisons does Astley invite you to draw between Harry and “the susso”? Why does “the susso” continue north despite the warnings of futility from Harry and the request by Clytie to stay? Why is “the susso” compelled to keep going “off the map”? What does he leave behind? Make a list of images that relate to the idea of being right off the map. Do you associate Harry with the metaphor of being right off the map? Explain to students that close reading is when a reader stops to reread a piece of text in order to think about why the writer has chosen to express themselves in a particular way and how this might relate to the rest of the text. Show students the extract below and ask them to highlight the words or phrases that made them stop and think in this passage. what is “transferred” in the metaphor. Astley’s fiction writing is highly poetic – lush, even. The senses play a prominent role in her description and often she blends visual and aural images in a single expression. The activity that follows, developed by Peter Elbow, encourages students to identify what he calls “pointing” and “identifying the centre of gravity” in a piece of writing. “Pointing” involves determining which words or phrases in a text “get through to you in some way”. Determining the “centre of gravity” involves deciding which sections seem to be a source of energy. This could be a minor detail or a more sustained aspect of writing. This activity enables students to express what the author has evoked through the description. Distribute these extracts (PDF, 118KB) from the text and have students read them slowly and carefully. Listen to the reading and, at the end of the reading, write down words or phrases that stick in your mind. They might be loud or full of voice; have a lot of energy; somehow ring true; carry special conviction. This is what Elbow calls “pointing”. Summarise what the writing is about: its main points, ideas and feelings. This is “the centre of gravity”. Summarise this response as a single sentence. Choose one word from the extract that summarises the extract. Choose one word that isn’t in the writing to summarise the extract. Invite students to then look for any patterns or resonances between the extracts. the war, image, expression’s potential representation in the other extracts. Irony is one of the hallmarks of Astley’s writing and, whilst she is caustic in tone, her eye on both the people and the landscape remains sympathetic. 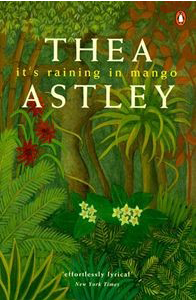 Astley’s ironic voice comes to the fore in It’s Raining in Mango particularly in the portrayal of injustice and ignorance. One way of portraying irony for students is to say that irony requires the reader to look beyond the surface meaning of texts resulting in the reader actually reconstructing meaning. In this activity students analyse Astley’s use of irony. consider possible meanings based on their knowledge of the author. Direct students to work in pairs and reread the opening (PDF, 115KB) to the story, “The Kiss, the Fadeout, the Credits”, noting down a specific element (words, phrases, sentences, visual layout). list possible meanings based on their knowledge of Astley. As a concluding activity, invite students to share their findings with the class prior to responding critically to one of the propositions below in an extended paragraph, speech or critical response. Despite her caustic tone, Astley’s observations on Queenslanders grow from a sympathetic perspective. Is this your view? Base your answer on close analysis of Astley’s use of irony in the text. Astley may be sympathetic to the ordinary Queenslander, but she is far from sympathetic to social institutions that foster ignorance and injustice. What is your stance on this statement? Defend your viewpoint with close analysis of Astley’s use of irony in the text. NB: This activity is an opportunity to assess student response to text and has potential as a mandated rich assessment task in the portfolio. It’s Raining in Mango can be described as a a family history. Situated in north Queensland, spanning the nineteenth to twentieth centuries, blending the dead with the living, Astley’s discontinuous narrative parodies the “family saga” genre. In the activities that follow students explore Astley’s portrayal of the saga of the Laffey and Mumbler families. Have you ever felt a sense of your past as Connie does? Are there stories in your family about how family members are like one another? Does the idea of family always make people feel linked in this way? Why or why not? Allocate to each student one of the characters from the text and have students make notes about their first impressions of this character. What were your first impressions of the character you have chosen? What drives your character to action? What behaviours and actions affect your response to this character? What is important about this person’s moral or spiritual life? What were your last impressions of this character? Identify the incidents that tell you most about this character and link them explicitly to your earlier answers. Analyse an exchange of dialogue that you think is revealing about your character. Invite students in groups to map how the first and last impressions relate to one another and how this affected the perceptions of that character in the group. My main interest . . . is the misfit. Not the spectacular outsider, but the seedy little nongrandiose nonfitter who lives in his own minihell. the role of social injustice and ignorance in positioning people as misfits. Throughout the activities in this section of the resource students explore aspects of style, characterisation and, now, storytelling. The activities in this section build on these understandings, enabling student to synthesise these understandings in a formal task. In this task students will create a visual representation of a character and then participate in a class question and answer session that explores the patterns and connections between the stories. As indicated previously in the Initial Response section of this resource, It’s Raining in Mango, is a discontinuous narrative, episodic and fragmented in structure, framed around a series of linked short stories that explore the impact of place and displacement on characters. Key characteristics of this storytelling form are: a discontinuous storyline where character and place create continuity; an internal mindscape of characters that echoes the physical and social landscapes they inhabit; episodic elements that create a snapshot of a moment, similar in some ways to poetry. In It’s Raining in Mango there are, as well, a range of storytelling devices that create unity across the text. Form the class into pairs and allocate each pair one of the stories. episodic elements that create a snapshot of a moment, similar in some ways to poetry. an extract from the story that they feel epitomises the “centre of gravity” for the story. the narrative perspective of Connie. Each pair then speaks to their representation, establishing the connections between their story and the others in the text. Students take questions from the class. NB: This presentation activity is suitable for elaboration and inclusion in the final portfolio. 3 am Epiphany and 4 am Breakthrough both by Brian Kitely. As indicated in the earlier pages, receptive and productive assessment strategies are integrated in this unit. Those tasks which lend themselves more strongly to one domain rather than the other are identified below. In this activity students experiment with aspects of Astley’s writing style to create their own texts. Students read an extract from It’s Raining in Mango and imitate the strategies she uses to create images in their own texts. Begin this activity with a brief minilesson on imagery. Ted Hughes writes in Poetry in the Making (p. 43) that creating character involves “the art of choosing just those details about a person that catch his or her life.” He points out that describing someone’s physical characteristics in general, for example statements such as, “He had brown hair and wore thongs” actually tells the reader very little. It does not “catch a life”. Hughes writes that statements such as his “hair was the colour of a rough coconut” are much more evocative for the reader. Display the quote from Hughes and the examples he gives. Make a list of the associations that the second example evokes and discuss whether this is more effective writing. How does the second example “catch a life”? In what circumstances could the previous example “catch a life”? Display for students this extract (PDF, 114KB) from It’s Raining in Mango where Astley introduces Bidiggi. As a class, list the images used, and the techniques Astley uses to create the images, to portray Bidiggi. Discuss with the class the defining concerns Astley takes on in this extract. What techniques does she use to attract the attention of the reader? choose a subject that is different from Astley’s but is suitable for her style and edit the copied section, rewriting it in the style of the author. This means that students preserve any specific techniques, adapting imagery and the sentence structures Astley uses. Invite students to read aloud their rewritings in groups and comment on the techniques used in their imitations. NB: This appropriation activity is an example of a critical-creative assessment activity that has potential as a mandated task in the final portfolio. Landscapes have an immense power to influence human feeling. The short story “Build Up” illustrates this as it depicts Will’s despair. These exercises illustrate a range of approaches to developing metaphor in the portrayal of landscape. Prior to experimenting with these, draw students’ attention to Astley’s portrayal of landscape. Introduce the association of landscape and feeling by inviting students to describe a place they love by detailing its destruction. (Another approach is to describe a place a character loves.) This place could be destroyed by nature, neglect, poverty or destruction done in the name of the improvement (echoing the bulldozers in the rainforest). how the writer feels about this. Invite students to now describe a different scene that particularly interests them without using comparisons of one thing to another. Students may need to rewrite this description to make sure it is free of comparison. Instruct students to use that scene to describe someone they know very well, for example a family member. Here students can experiment with comparisons. Invite students to use this scene in the portrayal of an event or situation involving the character they have chosen. This scene, although it is a description of the object or scene above, is really about the focus character. NB: This activity is an opportunity to assess student production of text. It also has potential as a mandated rich assessment task in the portfolio. Point of view determines how the story will be presented to the reader. In It’s Raining in Mango the stories are related, and interrelated, by Connie’s point of view. The reverberations of family history, the saga, are echoed through her character. When an author privileges the point of view of one character, the reader is invited to see the world through her/his eyes. The activities that follow are adapted activities in the chapter, “On Point of View” from Bret Anthony Johnston’s, Naming the World. Introduce the concept of point of view by having students imagine a confined place with a fireplace, a flickering fire and four characters: a six-year-old girl, an elderly grandmother, a nurse, and a murderer fleeing the police. What memories does the fire evoke for her? What have her parents told her about fire? What images will she use to describe the flames, their colour, their size, their movement? Will she want to touch them? Will she be afraid of them? Repeat this activity with the other characters and discuss the impacts of point of view on the telling of the story. You are a character watching two people who are discussing a memory of some kind. You are not participating in the events of the scene, you are just watching. Write for one page about this. Now focus on a single detail of one of the people you are watching – perhaps an aspect of dress, a mannerism, a distinctive physical feature. Write about that detail for half a page. Start the next sentence with “Now…” and finish the sentence as you return to the action of the story. NB: This creating activity could be included in the rich assessment portfolio. …interlinked stories…[whose]… narrative is discontinuous – there is no single plot – the environment and the characters are continuous. The shared environment is both internal – anxieties, pleasures, and confusions – and external – the houses, streets, hotels, and experiences. Other writers who have explored this form include: Henry Lawson, Shirley Hazzard, Elizabeth Jolley and Tim Winton. Divide the class into groups of four students and provide for each group four different images that are interlinked by either place, time, situation or event. Inform the students of the reason for the link. Art galleries and museum sites are useful resources for such materials – for example, the site Identity: yours, mine, ours from Museum Victoria, the photographic series Portrait of a Distant Land from the Art Gallery of NSW or Play, an exhibition by Sarah Rhodes documented at the Australian centre for Photography website. identify repeated ideas and expressions or other patterns in their writing. Invite the students to form back into groups and compare their understandings of the images and what these have to say about the link. develop their scenario and present their findings to the class. NB: This activity is an opportunity to assess student production of text and has potential as a mandated rich assessment task in the portfolio. Throughout this unit students have engaged in a range of writing activities. Students have created a reading journal, explored contextual aspects of the text, reflected on and experimented with aspects of Astley’s writing craft and drafted a series of creative and analytical responses. A sampling of these activities is highlighted in red text throughout the resource. This culminating activity is premised on the creation of a portfolio of responses, itself a rich task. There are different ways to approach the portfolio. One approach could be to allow students a free choice of what texts to include; another approach could be to mandate specific tasks for inclusion. The latter method could specify one particular receptive and productive task as previously outlined in earlier sections of this resource. drafts of their original and refined responses. What have you learned about Thea Astley in your study of this text? Document the growth in your understanding of this author’s work. A collection of responses that demonstrate the student’s experimentation with an aspect of craft, such as metaphor, point of view or image. A series of interlinked short stories and a reflection statement. A collection of responses that explores the place of the outsider in society. A collection of responses that explores the role of institutions in society. An analysis of Thea Astley’s poem “Short Story”, from Australian Poetry 1953 (ed. by Nan McDonald, Angus and Robertson, Sydney 1953) as the reference point for a portfolio. To stand off with the tide. Under the clear white sun. For thirty days and one. Bridging English, Milner, Joseph O’Beirne, and Lucy Floyd Morcock Milner, Upper Saddle River, N J: Merrill, 2008. Writing without Teachers, Elbow, Peter, New York: Oxford UP, 1973. Naming the World: And Other Exercises for the Creative Writer, Johnston, Bret Anthony, New York: Random House, 2007. Reading like a Writer: A Guide for People Who Love Books and for Those Who Want to Write Them, Prose, Francine, New York: HarperCollins, 2006. In the Middle: New Understandings about Writing, Reading, and Learning, Atwell, Nancie: Portsmouth, NH, Boynton/Cook, 1998. The Writing Book: A Workbook for Fiction Writers, Grenville, Kate, Sydney: Allen & Unwin, 1990. Poetry in the Making: An Anthology of Poems and Programmes from Listening and Writing, Hughes, Ted, London: Faber, 1967. 3 AM Epiphany, Kitely, B. Cincinnati, Ohio, 2005. 4 AM Breakthrough, Kitely, B. Cincinnati, Ohio, 2009. Thea Astley’s Fictional World, Sheridan, Susan, and Paul Genoni, Newcastle, UK: Cambridge Scholars, 2006. Print. “Thea Astley’s Writing: Magnetic North,” Goldsworthy, Kerryn, Meanjin 42, No. 4 (1983): 478–485. Unit Suitable For AC: Year 10 (NSW Stage 5). Also suitable for Year 11 or Year 12 Literature. Duration This unit is designed to be implemented through a series of workshops. These would best be delivered intensively in a six-week unit of work. ANN SMALL is an English consultant and occasional teacher at Western Sydney University and the Australian Catholic University, Strathfield. She has an extensive teaching background in both the public education and Catholic sectors in NSW. She has developed syllabuses for NSW and the Australian Curriculum, including F–10 English and the Senior Literature course.